In biology and ecology, extinction is the cessation of existence of a species or group of taxa, reducing biodiversity. The moment of extinction is generally considered to be the death of the last individual of that species. 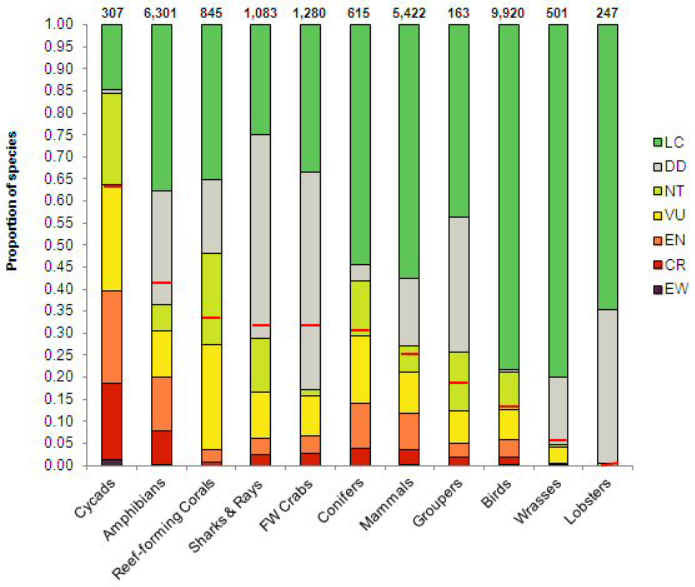 Species are classified in nine groups, set through criteria such as rate of decline, population size, area of geographic distribution, and degree of population and distribution fragmentation. Extinct (EX) - No individuals remaining. Extinct in the Wild (EW) - Known only to survive in captivity, or as a naturalized population outside its historic range. Critically Endangered (CR) - Extremely high risk of extinction in the wild. Endangered (EN) - High risk of extinction in the wild. Vulnerable (VU) - High risk of endangerment in the wild. Near Threatened (NT) - Likely to become endangered in the near future. Least Concern (LC) - Lowest risk. Does not qualify for a more at risk category. Widespread and abundant taxa are included in this category. Poaching- Many animals are hunted and killed for their body parts to be used for ornamental decoration as well as in superstitious potions. Currently, the demand for animal parts is centered in several parts of Asia where there is a strong market for traditional medicines made from items like tiger bone and rhino horn. Many animals are also killed for food ,this is referred to as bushmeat. Habitat Destruction- More and more land is being claimed by Man for his own ends. Centuries may be required to bring back a forest that was cut down or burnt out in the space of a few years. Many of the world's severely threatened animals and plants live in such forests, and it is certain that huge numbers of them will disappear if present rates of forest loss continue. Pollution-Chemicals and toxins that Man is releasing into the air and water causes an imbalance in ecosystems. Contamination of air, water, or soil by the discharge of harmful substances contribute to species extinction. Climate Change- The change in temperature and climate is affecting species that dwell on land as well as the ocean. Concern is growing that atmospheric changes could bring on rapid, profound climatic changes. A slight rise in maximum water temperatures - only one to two degrees can cause coral bleaching. 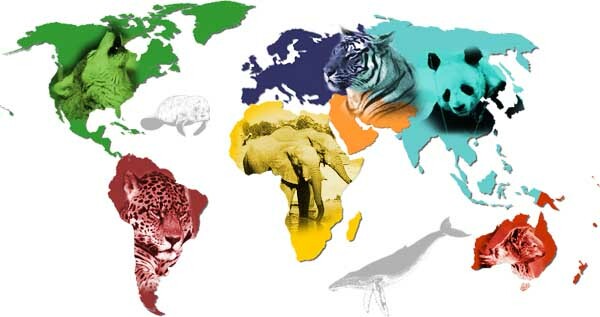 Introduction of Exotic Species-Species that "belong" to an area are said to be native species. Exotic Species are interlopers, foreign elements introduced intentionally or accidentally into new settings through human activities. Exotics may seriously disrupt delicate ecological balances and create a cascade of unintended consequences. World Wildlife Fund estimates that there are between 41,410 and 52,345 Asian elephants in the wild. Efforts to raise awareness for elephants’ fragile status include Elephant Appreciation Day. Is very close to extinction. There are believed to be as few as 40 left in the wild in Ujung Kulon National Park, Indonesia and none are currently in captivity. The IUCN Red List currently lists Javan rhinos as critically endangered. In October, poachers killed the last remaining Javan rhino in Vietnam. Several were alive in the wild in Vietnam as recently as 2004. A survey of surviving Javan rhinos in Indonesia found that there are very few females in the population. Are listed as endangered on the IUCN Red List. IUCN estimates that there are 4,080 to 6,590 snow leopards in the wild. A subspecies, the Amur leopard is critically endangered. Native to the Russian Far East and northern China, there are fewer than 50 left in the wild. In July, cameras recorded snow leopards in 16 different locations in northeastern Afghanistan. Are listed as endangered on the IUCN Red List. According to WWF, there are as few as 3,200 tigers left in the wild. In November, Interpol launched a campaign to save tigers in the 13 Asian countries where they still exist, reported the Associated Press. There were around 100,000 tigers in Asia in 1900.
which is native to Southeast Asia, is listed as vulnerable on the IUCN Red List. The Mekong River subpopulation, however, is listed as critically endangered. According to WWF, there are only 85 of these dolphins left in Southeast Asia. The limited range of this animal along with killing by fisherman has left Irrawaddy dolphin populations in danger. Is a small porpoise native to the Gulf of California. It is listed as critically endangered on the IUCN Red List. WWF estimates that there are around 245 vaquita left in the wild. They are most immediately threatened by “entanglement in fishing gear.” Fortunately, WWF helped authorities in Mexico to reduce bycatch of vaquita to a “level that does not threaten the population” by 2009. Are listed as endangered on the IUCN Red List. According to WWF, they are threatened by overfishing. A report from October found that eastern Atlantic bluefin is traded at twice the amount catch quotas actually allow. A subspecies of the eastern gorilla, is listed as critically endangered on the IUCN Red List. WWF explains that there are estimated to be about 786 individuals left in the two mountain gorilla populations near the Uganda-Rwanda-DRC and in a national park in Uganda. However, the two populations have grown by 14 and 12 percent, respectively, in the past decade. Armed conflicts and natural resource exploitation have been blamed for endangering the gorilla populations. Is listed as critically endangered on the IUCN Red List. According to WWF, they are the most endangered of the two orangutan species and there are about 7,500 Sumatran Orangutans left in the wild. Native only to parts of Sumatra, Indonesia, the orangutans are threatened by human agricultural and residential development. A recent study found that residents of Borneo killed at least 750 endangered orangutans in a one-year period. are listed as critically endangered on the IUCN Red List. According to WWF, there are about 34,000 nesting females left in the world and populations in the Atlantic are relatively stable. In the Pacific, however, there may be as few as 2,300 adult females. Their wide geographical distribution and shallow dive depth means they are threatened by longline fishing operations, explains WWF. A study from September found that although the number of sea turtles killed in U.S. fisheries has declined by 90 percent since 1990, it may not be enough to sustain sea turtle populations.